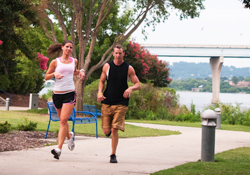 Visit the Tennessee Riverpark on any given day, and chances are you’ll find the trail alive with activity. Runners dash by in bright shoes, while bikers of all ages roll down the trail. Couples, families, and camera-toting individuals stroll past, taking in the sights and paying testament to the diverse appeal the trail creates. 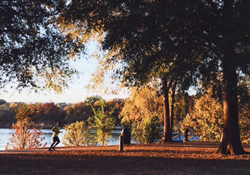 The Tennessee Riverpark is a 13-mile trail running through the heart of Chattanooga. 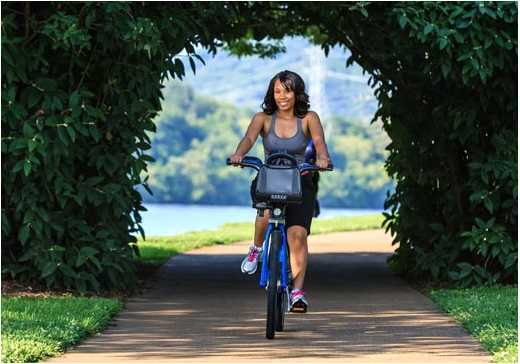 The trail follows the Tennessee River and provides a rolling path that’s easy to experience and explore. While a popular location for recreation, the trail also boasts art, historic sites, and the lush habitat of the Tennessee River. Along the way, visitors can experience much of the wildlife that call Tennessee home. Birds, reptiles, and small mammals make common appearances, bringing a touch of wild to the well-groomed trail. If history is more your speed, the Riverpark provides a gateway to many points of interest from Chattanooga’s past. Learn more about Chattanooga’s role in the Civil War, its timeline of production, and how the city has grown over the years. Plaques and signage give information on these various historic sites. For a more in-depth experience, download the easy-to-use riverpark app and let it be your trail guide (iPhone or Android). Photographers and art lovers just may find their new favorite spot, as public art is scattered throughout the trail. The designs make for fun backgrounds, and break up the scenery with color and patterns. If relaxation is more your aim, the Hubert Fry Center is the perfect spot for an afternoon gathering. The center is home to a variety of picnic tables and grills, and shelters are available to rent. Five fishing piers allow access to the Tennessee River and two boats ramps make for easy boat put-in. Additionally, a playground and open spaces will delight children and adults alike. And let’s not forget recreation. With its recent expansion into St. Elmo, the Riverpark now boasts 13-miles of uninterrupted trail that beg to be explored. The Riverpark is accessible throughout the trail, but nine trailheads allow for parking and direct entrance. Most of these include restrooms and bike repair stations. 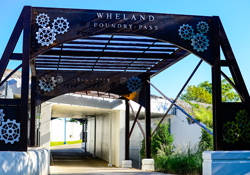 Access points include Powerhouse Road, the Hubert Fry Center, Lost Mound Road, the Marsh off Amnicola Highway, Curtain Pole Road, the Rowing Center, Blue Goose Hollow, Chestnut Street Road, and the Wheland Foundry. The Riverpark is open from dawn until dusk, seven days a week. Parking is available at any of the trailheads or throughout downtown. No pets, swimming, open fires, alcohol, skateboards, or firearms are allowed. Bikers and rollerbladers should watch out for pedestrians and share the path.